Spinach is a great plant to grow in late summer for over-wintering. Sow seeds now for a harvest from October to April. Ensure the growing medium is rich in well-rotted organic matter or garden compost. 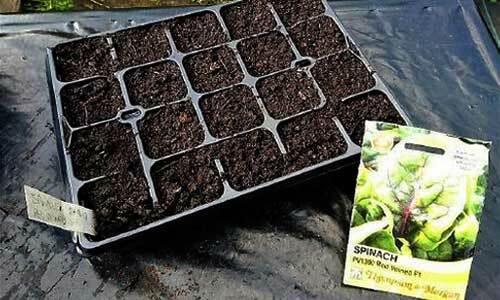 Sow seeds 1cm (1/2") deep in rows 30cm (12in) apart, or in a cell seed tray or in large containers. Thin seedlings to 7.5cm (3in) apart when large enough to handle. Once plants have established, harvest the leaves continually once they're large enough to pick. Spinach prefers a bit of shade and will happily grow under the shade of larger plants. Keep well-watered during dry periods to avoid bolting. Spinach is a cool-season crop that can withstand short spells of frost with a little protection. Plants will need cover from October in a polytunnel, greenhouse, cloche or protect the crown with straw or similar material and cover with fleece. Young spinach leaves are great in salads, and larger, older leaves are used for sandwiches or in soups, sautés, and stir-fries.